La Torre Golf Resort Murcia is an excellent location for holidays all the year round, with Murcia and the Costa Cálida enjoying 320 days of sunshine and average temperatures of 21º C. The grand entrance to the resort is lined with palm trees, water features and benches. Spread throughout the landscaped complex are fountains, lush plants and lemon, lime and palm trees that give the resort an authentic Mediterranean feel. Only minutes from the golden beaches of the Mediterranean and the safe, warm waters of the Mar Menor (‘Little Sea’), La Torre Golf Resort Murcia is just 22 minutes’ drive from the airport at San Javier and 70 minutes from Alicante airport, making it easily accessible from anywhere in the UK. A truly Mediterranean community, La Torre Golf Resort is spread over one square mile of sun-drenched Spanish countryside. The centrepiece of the resort is the 18-hole Jack Nicklaus-designed golf course. But it is not all about golf. You can take a dip in one of the 22 luxury swimming pools (including 5 children’s pools). Maybe relax or practice your serve on the tennis courts. Or have fun with the kids at one of the many children’s playgrounds. Spread around the resort, you’ll find outdoor gym equipment, pétanque, basketball, football and table tennis. Two locations for the gym equipment are just 50 metres from the townhouse, with two pieces of equipment at each. Click on the map to view all the locations. If you want a break from the action, you can relax over a glass of the excellent local wine at the La Torre Golf Resort Hotel & Spa or enjoy fine dining in one of the restaurants. Laid out around a verdant Jack Nicklaus-designed 18-hole golf course, its white-washed properties are a dazzling mixture of villas, townhouses and luxury apartments. The resort’s wide avenues are flanked by landscaped gardens and the most varied local flora. Its plentiful facilities include twenty-two large swimming pools, a driving drive and two tennis courts. For the younger ones, you’ll find several children’s pools and a number of play areas with slides and swings. Two play areas are less than 60 metres from our property. Comfort, convenience and peace-of-mind are priorities at La Torre Golf Resort Murcia. It boasts a gated entry system together with 24-hour manned security. The Resort’s bustling town centre is clustered around the shimmering lake. It includes the hotel and spa, a large supermarket, a travel agents and also a beauty salon and hairdressers. In addition, there’s a 24-hour cash machine, the Club House and several restaurants and bars. These include an Italian, a tapas bar, a pub, a speciality rice restaurant and an ice cream and milkshake bar. 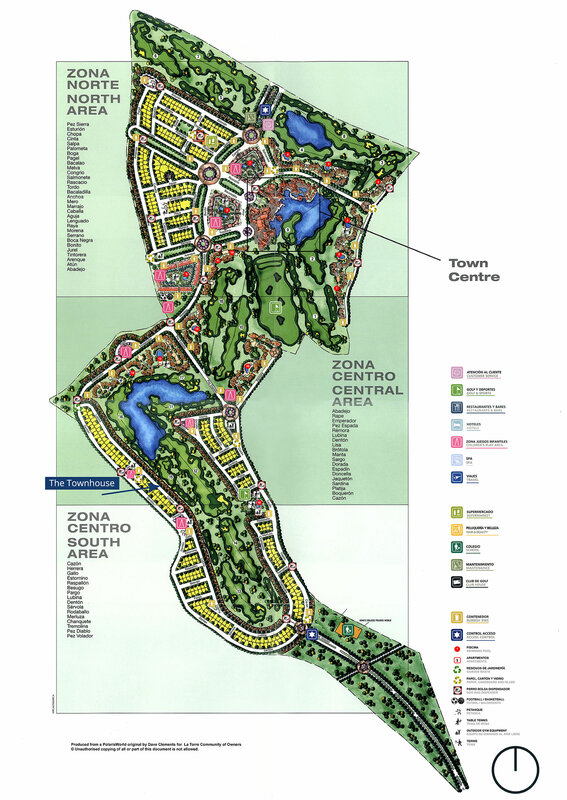 Check out the map of La Torre Golf Resort on the right to view the locations of the swimming pools and outdoor sports facilities, including the gym equipment. Produced from a Polaris World original by Dave Clements for La Torre Community of Owners. © Unauthorised copying of all or part of this document is not allowed. Take a look at this video, courtesy of Golf Property Store. Click the link to book your holiday accommodation at La Torre Golf Resort. La Torre Golf Resort Murcia covers an area of 1.4 million square metres, with 2,648 properties – a mixture of 1,728 apartments, 446 villas and 474 townhouses. Building work started in 2003 and finished in 2006. We have owned our frontline townhouse since December 2006. The 18-hole Jack Nicklaus-designed golf course is 5,350 metres long and par 68. La Torre Golf Resort was featured in two major British television campaigns, with one commercial featuring Jack Nicklaus and the now-famous line ‘Maybe tomorrow, Jack’. In September 2009, the resort played host to the Davis Cup semi-final between Spain and Israel. Crowds of up to 12,000 packing the temporary stadium erected specially for the three-day tennis event. American film director/actor/writer/comedian and jazz musician Woody Allen played clarinet with his band at the Resort’s hotel on New Year’s Eve 2008. X-Factor finalist Ruth Lorenzo featured regularly at La Torre in the early days. 70’s soul/funk band and Grammy award-winners Kool & The Gang (‘Celebration’, ‘Ladies Night’) have played a concert in the Resort centre.